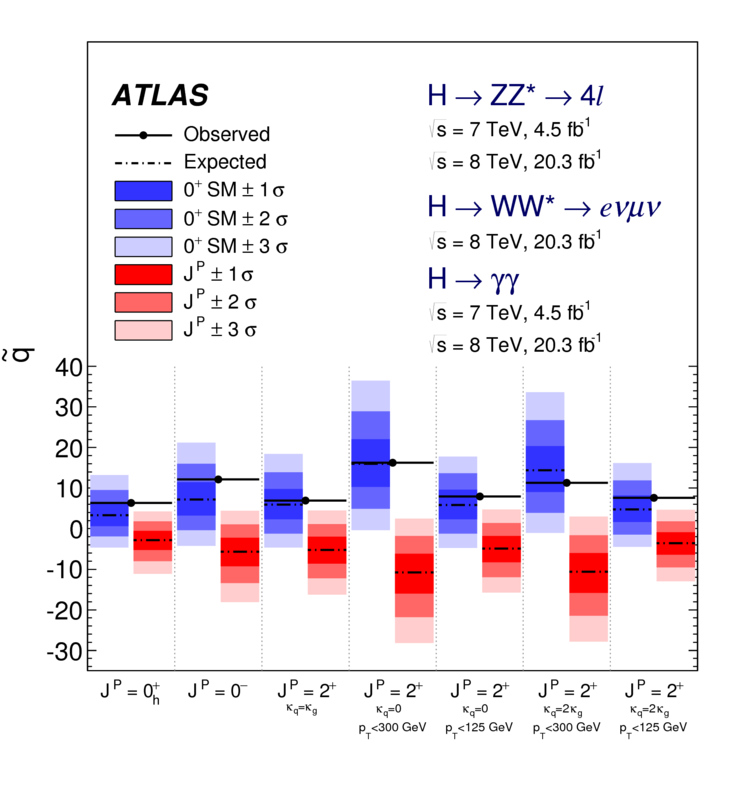 On July 4th 2012, the ATLAS and CMS experiments at CERN's Large Hadron Collider announced they had observed a new particle in the mass region around 125 GeV. This particle is consistent with the Higgs boson predicted by the Standard Model. On October 8th 2013, the Nobel prize in physics was awarded jointly to François Englert and Peter Higgs "for the theoretical discovery of a mechanism that contributes to our understanding of the origin of mass of subatomic particles, and which recently was confirmed through the discovery of the predicted fundamental particle, by the ATLAS and CMS experiments at CERN's Large Hadron Collider." 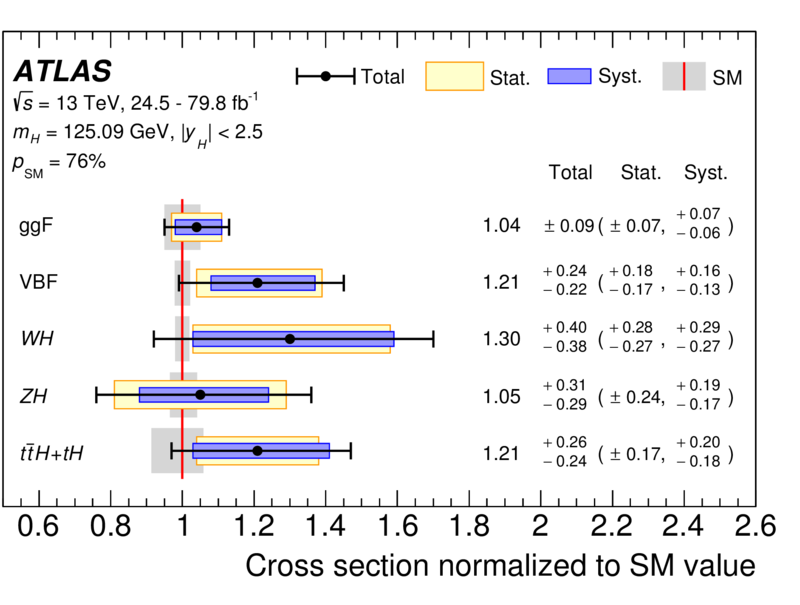 To really understand the Higgs boson, more studies and a full characterization is needed. Small deviations in the Higgs boson properties could indicate New Physics. TRIUMF scientists, postdoctoral fellows and students are contributing to various measurements of the Higgs boson. There are the various Higgs boson production modes. 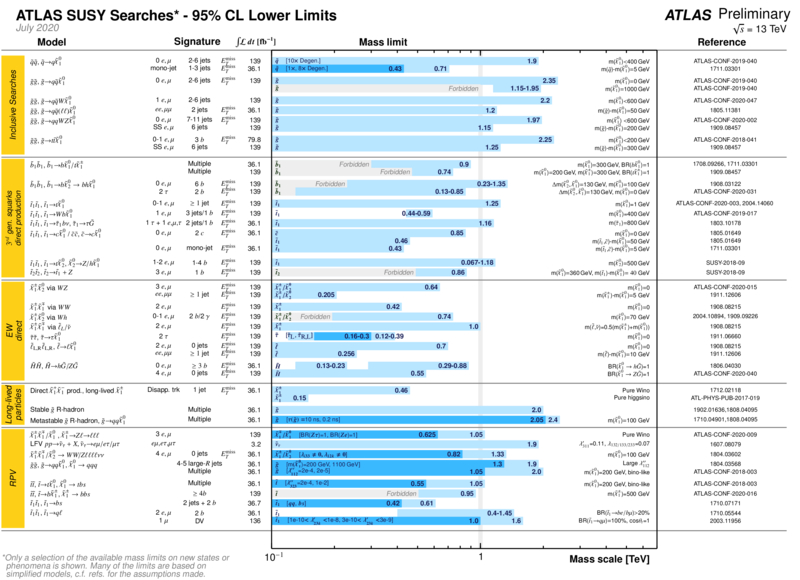 The discovery in 2012 was dominated by the gluon-gluon fusion (ggF) production, but there are production modes such as vector boson fusion (VBF) and Higgs production in association with top quarks (tt̄H) that ATLAS recently observed. 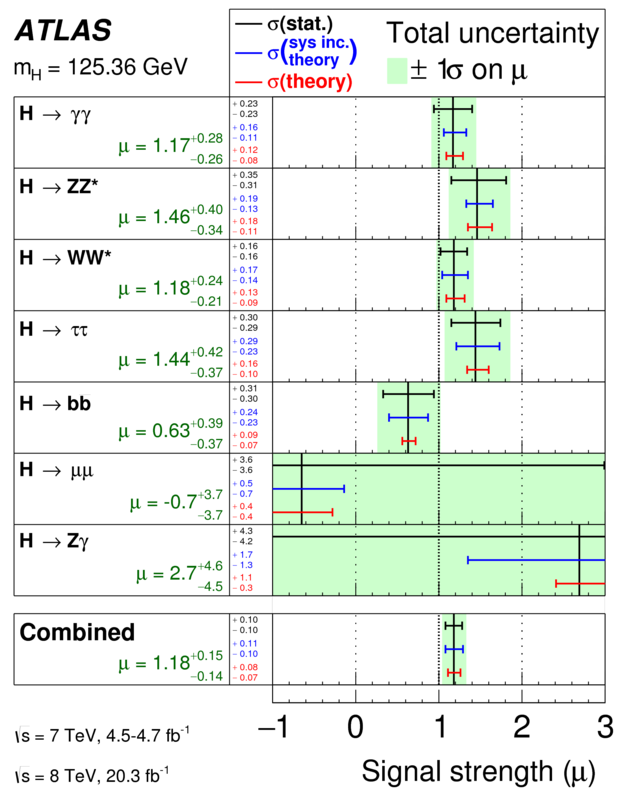 The discovery of the Higgs boson was made through analyses of the bosonic decay modes in H → γγ, H → ZZ∗ → 4l and H → WW∗ → lνlν (l = e, μ) events. Since the discovery, these analyses have been improved and updated with more data. More recently, ATLAS reported observation in the fermionic decay modes in the decays of H → ττ and H → bb. From these measurements the crucial Higgs boson couplings can be exracted. In the Standard Model (SM), the Higgs boson is a CP-even scalar particle, JCP = 0++. Following the 2012 discovery, TRIUMF researchers were involved in several alternative hypotheses with JP =0−, 1+, 1−, 2+. The data favour the Standard Model quantum numbers of JP=0+. Theories of physics beyond the SM often require an extended Higgs sector featuring several neutral Higgs bosons. Such cases may include CP-mixing in the Higgs boson interactions, which could result in observable differences in the kinematics of final-state particles produced in their decays. In many ways, the Higgs boson is a radical idea, since elementary scalar particles do not enjoy the naturalness properties of the other elementary particles. Unlike fermions and gauge bosons, the mass of a scalar tends to be raised up to the next higher mass scale of New Physics due to the loop corrections inherent in quantum field theory.The existence of a Higgs boson then suggests that there is New Physics at a relatively low mass scale and so this motivates the extensive search for physics beyond the Standard Model. The two broad classes of models addressing the naturalness problem are Supersymmetry where the Higgs boson remains elementary and the corrections to its mass are canceled by new supersymmetric particles. The other approach invokes the existence of new strong interactions that induces strong breaking of the electroweak symmetry. One particular realisation of this scenario is referred to as composite Higgs model where the Higgs boson is not a fundamental scalar similar to all other scalar particles observed in nature. Supersymmetry is an extension of the Standard Model that offers an elegant solution to the hierarchy problem by fixing the mass of the Higgs boson. It predicts a partner particle for each particle in the Standard Model. If the theory is correct, supersymmetric particles should appear in collisions at the LHC. Searches for Supersymmetry are often grouped by their production mechanics of SUSY particle production through either the strong or electroweak force. TRIUMF researches have searched for SUSY particles in leptonic and hadronic decays through production of supersymmetric quarks (stop quark) and supersymmetric gauge bosons and leptons (chargino, higgsino and sleptons). In many theories scientists predict the lightest supersymmetric particle to be stable and electrically neutral and to interact weakly with the particles of the Standard Model. These are exactly the characteristics required for dark matter, thought to make up most of the matter in the universe. 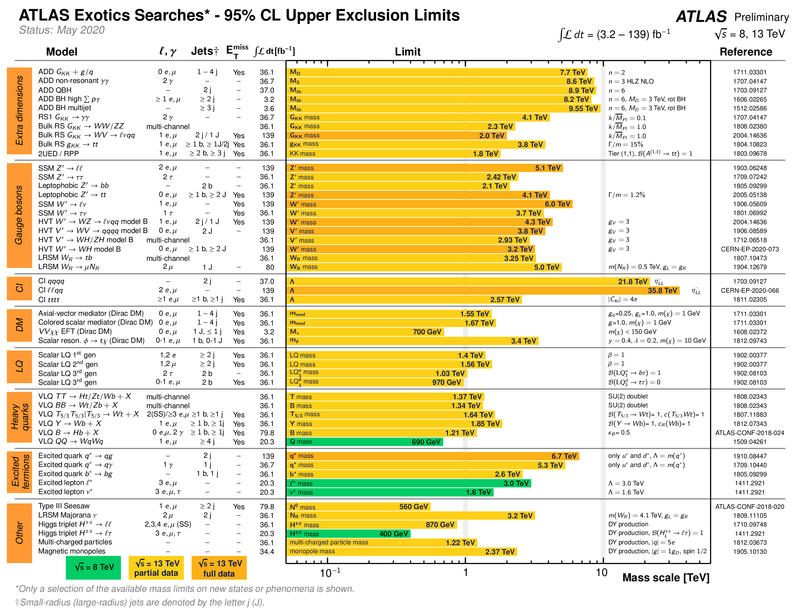 Searching for physics beyond the Standard Model with a signature-based program is the domain of the ATLAS Exotics searches focusing on non-supersymmetric models ranging from Extra Dimensions and mini Black Holes to Dark Matter, extended Higgs models, and Compositeness. Models with large extra-dimensions offers solution to the naturalness problem by lowering the fundamental scale of quantum gravity. All of the possible extensions addressing the naturalness problem predict new particles, either as a result from an extended Higgs sector, supersymmetric partners or resonances from new strong dynamics. Researchers at TRIUMF have focused on searches for new high mass resonances in various final states. New resonances are predicted in many extions of the Standard Model.